Cooking can be intimidating. There are so many ingredients, steps, and ways to mess up dinner. I used to think that cooking was a talent, but it’s actually about ratios, methods and templates. Once you know and understand these, you can cook anything! 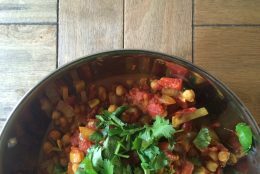 Which brings me to Heather Crosby’s new book, YumUniverse Pantry to Plate: Improvise Meals You Love – from What You Have! It is just what you need to be able to cook without a recipe. I know how easy it is to eat out or rely on convenience foods because cooking a meal from scratch seems like a daunting task. I’m totally with you – so trust me on this one! 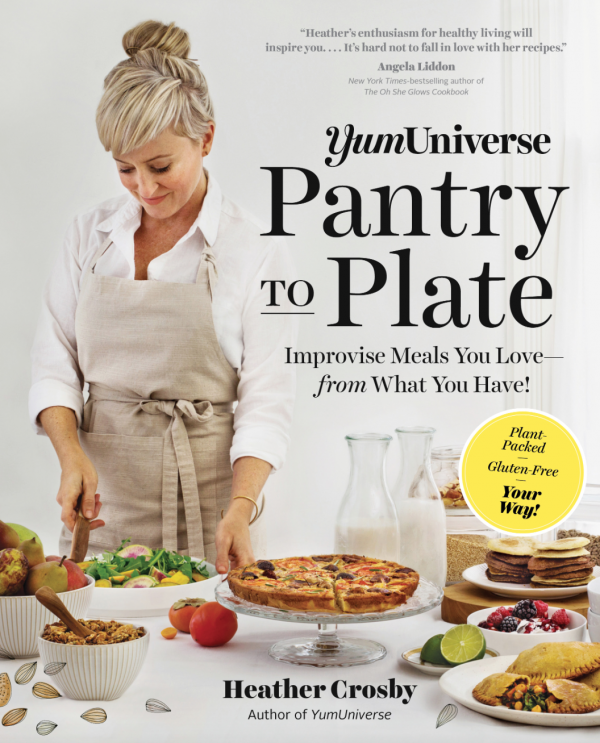 YumUniverse Pantry to Plate is like cooking school in a book. A really friendly, pretty, patient cooking school. Heather takes you through cutting techniques, the basics of creating the foundational flavors for ethnic dishes, and how to freestyle it in the kitchen. The most valuable portion is the templates. These templates teach you how to improvise and get weeknight meals on the table that you want to eat with flavors and textures you enjoy. 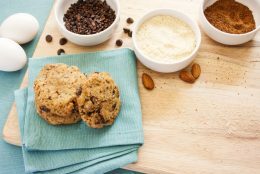 You can make your own spin on breakfast cookies, veggie fries, epic salads, and nice cream. If you’re worried that templates aren’t enough to get you cooking on your own, worry not! There are recipes that go along with each template to illustrate various ways to make a dish. And did I mention that all the recipes are vegan and gluten-free?! Dream. Come. True. 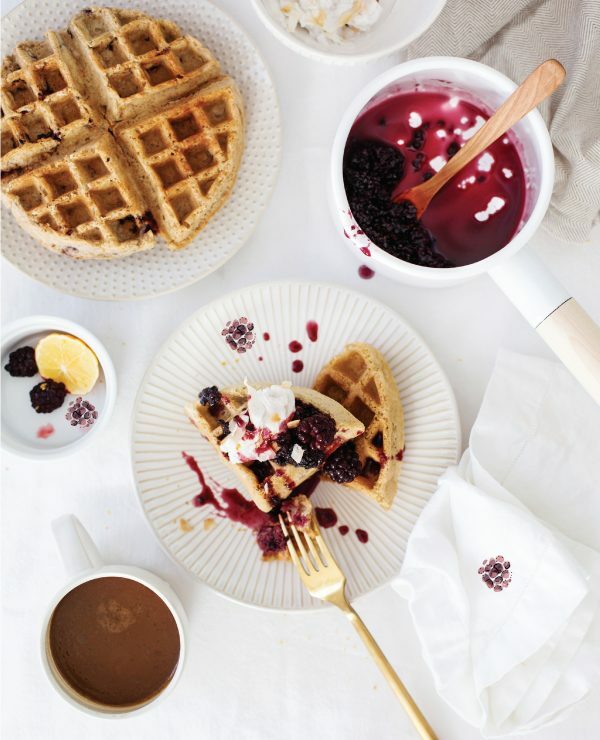 Before you run off to buy the book, let me share one of Heather’s recipes using her pancakes and waffles template: Meyer Lemon Waffles with Maple-Blackberry Compote! When I get my hands on Meyer lemons, my inner schoolgirl squeals! Their sweet, floral flavor makes this recipe special—you’ll need one large Meyer lemon (or two small). Can’t find Meyer lemons? Regular lemons work fine. No waffle iron? Make pancakes instead. Follow the simple steps on page 91 to prepare the Maple-Blackberry Compote. If making the Toasted Coconut Cream, open the can of chilled coconut milk. 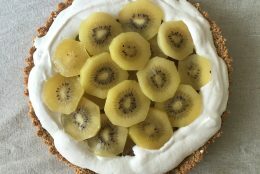 Scoop out the solid cream on top and transfer to a large bowl—save the liquid in the fridge for Soup (page 175) or a smoothie. Whisk together the toasted coconut and cream and place in the fridge to chill. Preheat a waffle iron and grease with oil. In a large bowl, whisk together the flours, psyllium, baking powder, baking soda, and salt until thoroughly mixed. In another bowl, whisk together the water and lemon juice. Fold together with the dry ingredients and then incorporate the zest. Using a ladle, pour batter into the waffle iron and cook until the edges are crispy. Repeat, adding more oil when necessary, until all batter is used. Top with Maple-Blackberry Compote and a dollop of Toasted Coconut Cream. Here’s to more plant-packed, homemade meals done your way!